The densely populated neighbourhood of Comuna 13 is an expanse along the western hillside of the city of Medellin, Colombia. 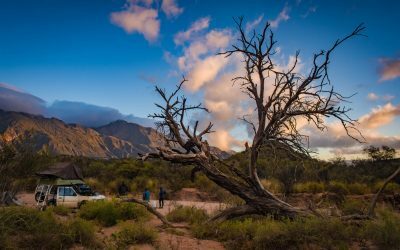 The poverty, winding roads and proximity to the main highway made it notoriously easy for cartels and gangs to transport illegal goods, hide out and recruit locals. The violence here between the cartels, gangs, and paramilitary from the ’80s right up until the 2000s was notorious. 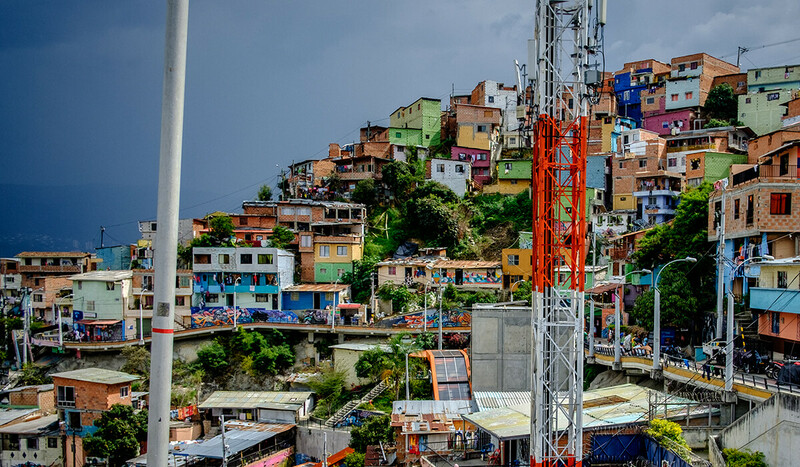 Comuna 13 was the Most Dangerous Neighbourhood in Medellin back when Medellin was the Murder Capital of the World. Sounds like a fun place to visit, doesn’t it? 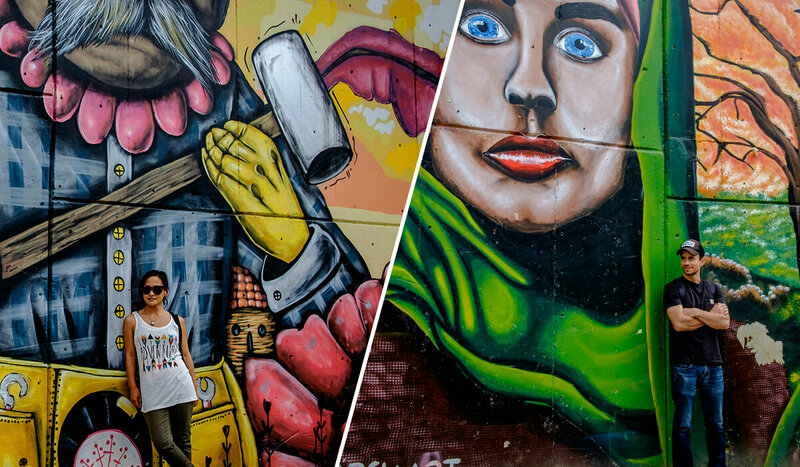 These days, though still riddled with its share of problems, Comuna 13 is trying to shake its sordid past and history of violence. It’s a lively working class neighbourhood. And it’s been revitalized through improved public access, renewed infrastructure, and community-supported art and cultural development. Strangely, though not surprisingly, it has become a tourist destination. Foreigners and even locals wander around and take in the neighbourhood vibes. Group tours are a common sight and have been so since 2014 when young neighbourhood residents started leading groups as a way to proudly showcase their neighbourhood as a place of revival and resilience. 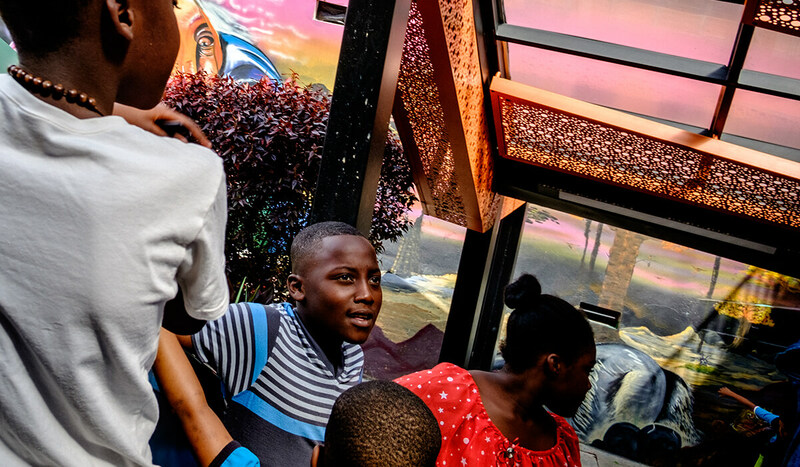 The main attraction is the escaleras electricas – the largest outdoor network of escalators in the world. The easiest way to get to the escalators is to take the subway train to San Javier station. It’s about a 20 minute walk to the escalators through local streets. Alternatively you can take a bus (221i or 225i) or a taxi (around $5000 COP). Walk if you can and get a real feel for the neighbourhood! We had watched the first season of Narcos while in Medellin in 2016 and the irony was not lost on us. 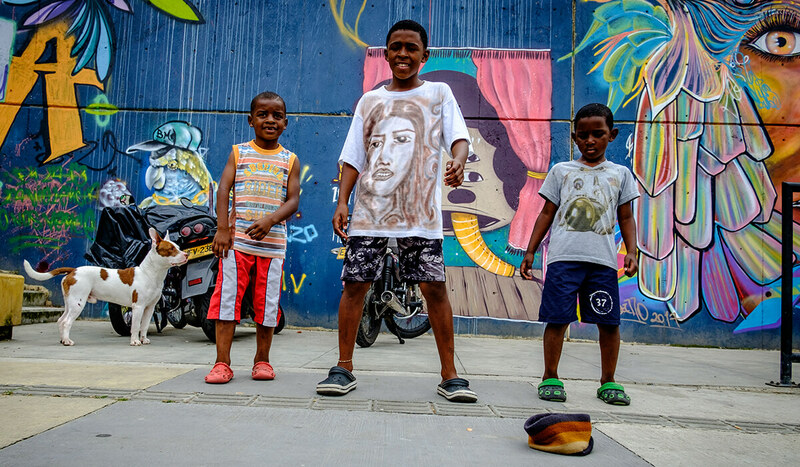 Comuna 13 was the very neighbourhood that was controlled by the infamous Pablo Escobar during the ‘80s and ‘90s. There was a haunting familiarity as we strolled through the neighbourhood. We understood that, while the show was loosely based on actual events, there were actual, very violent, events in very recent history. Sadly, the violence did not cease after Escobar’s death in 1993. Gangs and the paramilitary continued to battle over control of the area. And though much less now than before, the gang violence is still a big problem and Comuna 13 is still considered one of the most dangerous neighbourhoods in Medellin. 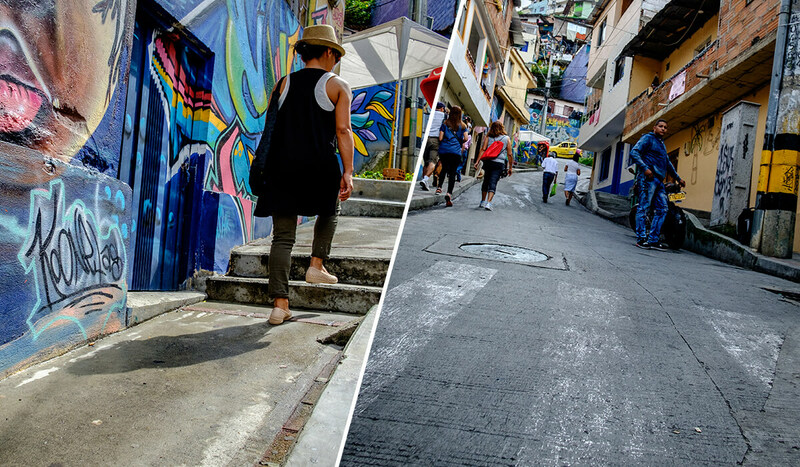 But in 2011, things began to change when the government built the escaleras – a 384 metre long outdoor escalator that connects the higher hillside barrios of Comuna 13. Generally, the higher you go, the poorer it gets. Much of the problem in the past was lack of access – by the Comuna residents to the rest of the city and by the police to the Comuna. With the new escalator, people could enter and leave the barrio with greater ease and speed than ever before. The change has been so dramatic over the recent years. Residents are no longer afraid to leave their homes. Kids play outside on the streets. And vendors sell everything from food to Comuna 13 merchandise to tourists who are visiting the Comuna on a daily basis. There is also now a public library and community centre. Murals and graffiti adorn almost every wall surrounding the escalator, all of which have been created by local artists from the neighbourhood. You can go with a guided tour. But Shane and I went independently with a group of new friends (both locals and foreigners). Walking through the neighbourhood as an outsider, we knew full well its past reputation. So we were amazed, even surprised, at the normalcy of everything – the busy streets, the buses going by, the people eating lunch at the open air restaurants, sitting on stoops chatting. It’s a regular neighbourhood with resilient residents who, not so long ago, were restricted by a 6 pm curfew to try to curb the violence. From the subway, we meandered our way through the winding streets to the escalators. We rode the escalators to the top and wandered around the surrounding area. And just like all the other tourists, we took pictures of the graffiti and the vistas overlooking all of Medellin. It always feels a bit intrusive taking tourist photos of a place where people live. We experienced it daily when we lived in Cusco. But everyone we came into contact with was incredibly friendly and helpful, proud that people wanted to visit their neighbourhood. And more than that, they were just living their life. Everything was just so normal. That said, we didn’t stray far from the escalators. And it probably wouldn’t be the wisest thing for a foreigner to wander the barrio at night. 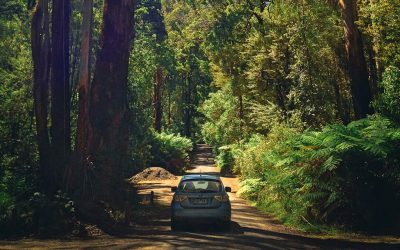 Like any place, a sense of adventure and curiosity is best balanced with a bit common sense. 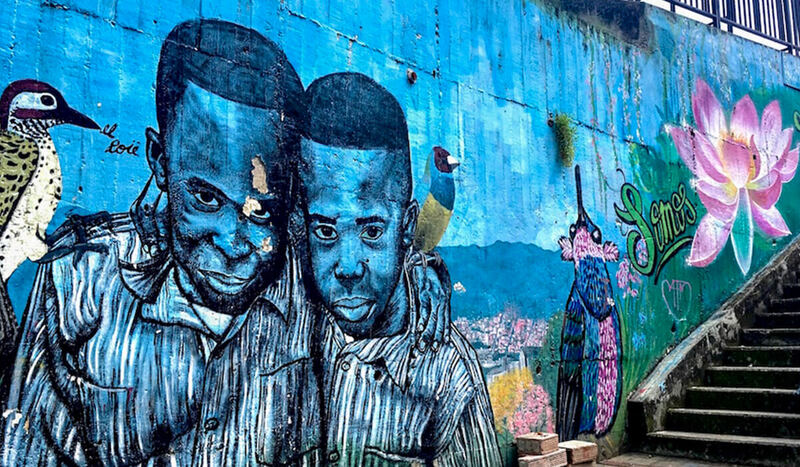 If you’re travelling through Colombia and plan to be in Medellin, Comuna 13 is worth a visit, whether with a tour or on your own. Spending the afternoon in this notorious hillside barrio shone a light on its incredible evolution over recent years. We’re glad we went. Neighbourhoods like this broaden your perspective of the world. And it’s humbling to have the chance to enter these spaces even if just for a moment. 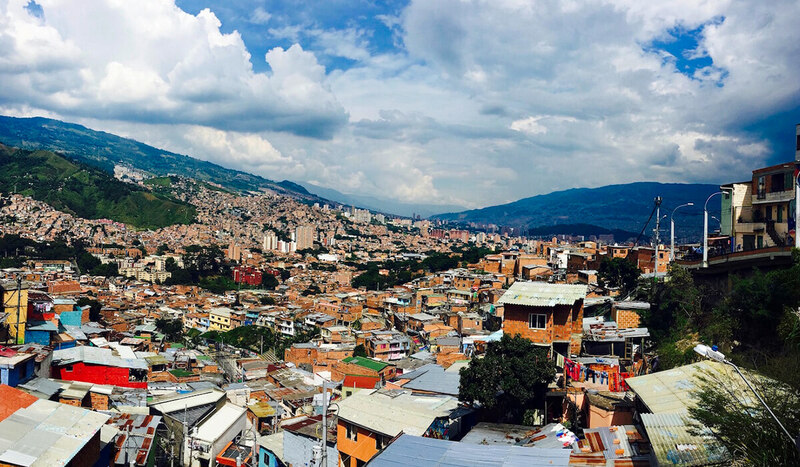 Do you have any questions about visiting Comuna 13 or Medellin in general? Have you been to Comuna 13? What was your experience? We’d love to hear from you in the comments section below!